Proper outdoor wireless installation is the most important element of a wireless backhaul system. Over the past decade I have troubleshot hundred's of wireless backhaul networks and 95% of the issues I have seen are due to improper wireless installation. Many would argue that choosing the right outdoor wireless bridge equipment is the most important. I would agree that there are both good and bad outdoor wireless backhaul equipment on the market, but for the most part the majority of wireless backhaul manufactures build pretty reliable radio hardware. The biggest difference comes between Carrier/Enterprise grade (higher end, low latency, microwave equipment that typically have a 20+ year shelf life) and Value Line equipment (typically under $5K and using 802.11b/g/a/n chip sets). Others would say that proper wireless network design and choosing the right technology, e.g. licensed microwave links or unlicensed wireless backhaul systems, is the most important. There are pluses and minuses with both systems, such as: potential wireless interference on unlicensed wireless backhaul systems or the need for clear line-of-sight with a licensed microwave link. Both systems if installed properly can provide reliable networks. Proper wireless engineering will produce the optimum wireless network design using the appropriate equipment. Even with the best wireless network design and best outdoor wireless backhaul equipment on the market, improper wireless installation will prevent a wireless backhual network from truly working to its potential. Many times we hear clients say the system worked fine when it was first installed but it has degraded over time. This can be caused by many issue. There was no interference when the system was first installed. Trees or other obstructions are now in the path, either creating a complete Fresnel Zone blockage or partial encroachment on the first Fresnel Zone. Antennas could have come out of alignment. Cabling and connectors could be weathered or damaged. The list goes on. Just like a race car, it must be built properly and maintenanced to work optimally. Many outdoor wireless bridge systems we troubleshoot lack proper materials for cabling, mounting, and weather proofing. Over time these systems get effected by the weather and slowly degrade. Systems that are not weather proofed correctly can get damaged over time by water getting into the connections or cabling. Improper mounting can cause antenna systems to come out of alignment. Systems installed with out the proper amount of fade margin can also have periodic issues with weather (see my article "Does Weather Effect Wireless"). Wireless backhaul, whether you are talking about wireless mesh, WiMax, point to multipont wireless, or point to point wireless backhaul, systems can function with extreme reliability and predictability if installed correctly. The mobile wireless carriers take this matter critically and waste no expenses on ensuring their systems are installed properly. Any down time can cost them tens of thousands of dollars. The craziest thing we see is organizations that are willing to rely on wireless technology for their primary connectivity but pinch pennies by choosing the cheapest and many times least experienced installation companies. Worst is when a manufacture convinces and end user with little to no experience installing an outdoor wireless bridge that they can do it themselves. 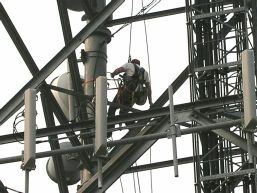 The best wireless installers are those that have a lot of tower installation experience. They typically install systems to last for many years. They also don't want to lose revenue having to come back and climb a tower again to repair a bad installation. Even though many of the outdoor wireless systems seem straight forward or easy to install based on the manufactures operation manual, the fact remains that outdoor wireless installation is a skilled trade and best performed by professionals with years of experience. You can change the oil in your high end sports car but that doesn't mean you should!